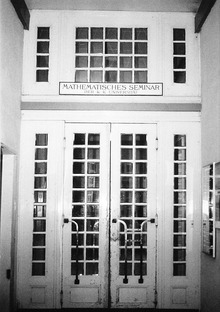 "Philosophy and science between the wars" appeared in the Books and arts section of the print edition under the headline "Talking heads"
Entrance to the Mathematical Seminar at the University of Vienna, Boltzmanngasse 5. Meeting place of the Vienna Circle. ON OCTOBER 21st 1916 Friedrich Adler, a theoretical physicist turned socialist politician, went to a famous restaurant in Vienna and ate a three-course lunch. Having lingered over coffee, he went up to Karl von Stürgkh, the imperial prime minister, who was sitting at a nearby table, and shot him several times with a pistol, killing him. Adler, the son of the legendary founder of Austro-Hungarian social democracy, calmly waited to be arrested. Something had to be done to change the general way of thinking, he claimed, and he had done it. At first condemned to death, he was pardoned two years later. When the Nazis came to power in Austria, Adler, by then the secretary of the Socialist Workers’ International, held urgent meetings with other socialist politicians to work out a common strategy. During one of these meetings, an emotional Adler rambled on, seemingly unable to come to the point. “He shoots better than he talks,” one French delegate remarked drily. “Exact Thinking in Demented Times”, Karl Sigmund’s fond and knowledgeable exploration of the ideas and members of the legendary Vienna circle between the two world wars, contains stark warnings not only about demented times, but also about the possible costs of exact thinking. 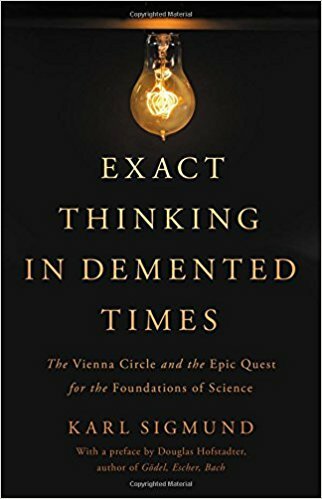 The Vienna circle was made up mainly of physicists, mathematicians and philosophers, whose fortnightly meetings were dedicated to investigating problems of logic, science, language and mathematics. Led by Moritz Schlick, a philosopher, the discussions attracted some brilliant intellectuals, including Kurt Gödel, a mathematician; Otto Neurath, an economist; three philosophers—Rudolf Carnap, Sir Karl Popper and Ludwig Wittgenstein (pictured, whose work became the main focus of the discussions for a while)—as well as Albert Einstein and Bertrand Russell.